I always dreamt about being a tennis professional. I love playing tennis and it's the only sport I play. I'm lucky to be able to play almost everyday. Thinking back to 20 years ago, Vietnam was very poor and I knew my dream couldn't come true. I was born in a working class family and we couldn't afford to play tennis as the time I was growing up. Tennis was considered a sport only for rich people. 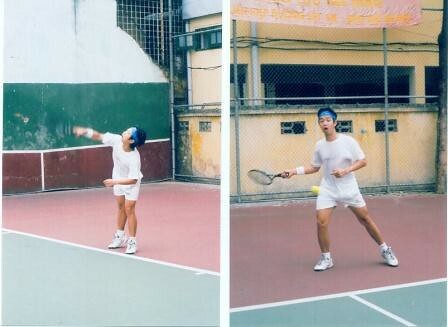 I remembered going to the tennis center in Yersin Street in Nha Trang and watching from outside. I started playing tennis when I was 20 after I started working. It was tough to manage my time as I had to go to school every day in the afternoon, evening classes in the evening and working in the morning. But I promised myself to give tennis a try. I played with my own coach three times a week at noon between my work and school commitments. In fact, before I started working, my father wouldn't allow me to play. He thought that it would reflect badly on the family. It's now 12 years since the first day I hit a tennis ball. Since then, I have actually played in a few tournaments but never make it past about the third round. The first time I ever played in the Hanoi Open, I couldn't sleep for the whole night and keep going to the bathroom every half hour. By the time I played I was so nervous and exhausted that I could hardly get the ball in the court. I love watching tennis too and I have stayed up all night long just watching Hingis and Federer playing their matches. Maybe you guys think that I am crazy but I just love them and I was really sad when Hingis retired then happy when she announced her comeback but truly sad when she retired last year. I hope Roger Federer will retain his old form and break the grand slam records of Sampras. Guess who is going to win Roland Garros? 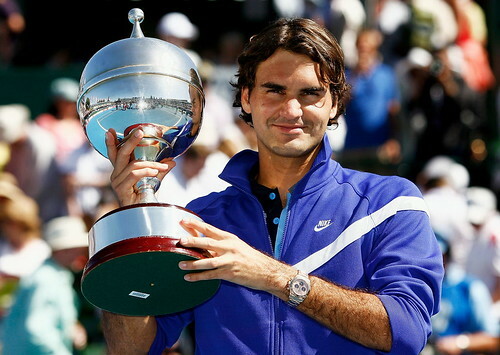 I hope Roger will win this time. 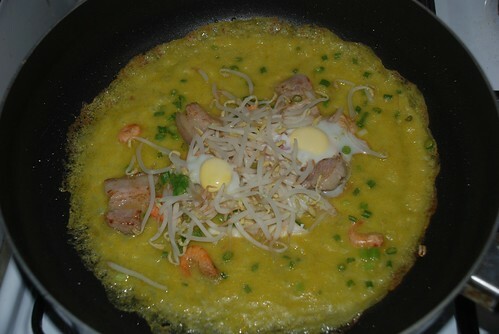 Last night, I looked up my Nha Trang food photos and my mouth was watering at the Banh Xeo (steamed rice pancake) photos. I decided to make it tonight for dinner. 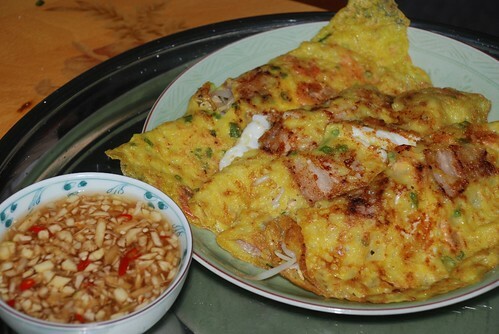 Huong, my cleaner, went to the market and got some prawns, pork, vegetables and squid and I went to buy rice flour, different kinds of herbs, beanshoots and some more pork. It's nice to make something different for a change at home. It took 30 minutes to get everything ready and quite easy as the flour had instructions on the bag. I do know how to make this cake as I ate and saw it alot when I was in my city. The dipping sauce is the most important as it determines the taste of the whole dish. Ms Huong made a dipping sauce using the WildRice restaurant recipe. It tasted great but in Nha Trang we make it a little bit different, slightly fruitier with more pineapple and lemon. I will make this sauce next week when I have another go at Banh Xeo next week. When I'd finished and had more than enough myself, I gave my landlord some cakes and he just loved them, as did my housemate and Huong. This was the first time she's ever made this cake, and even though she thought it was difficult to make, Huong said she's going to try it at home for her family. 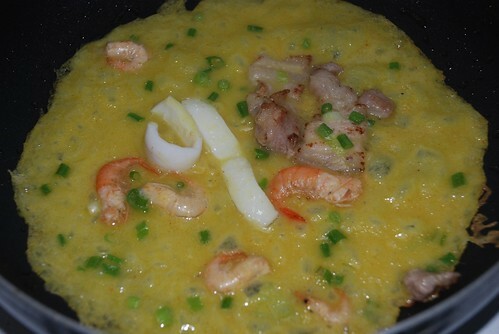 It really is a great dish from the south of Vietnam. Weddings in the countryside in Vietnam are common, even if you live in major cities and most of your friends do, too. Most people who reside in urban areas have some ancestry in a rural province. ‘My fatherland’, even ‘my countryside’, is a commonly heard reference, even though they may only visit the place once or twice a year. Getting married often means organizing a countryside wedding, sometimes in two provinces, the bride’s and the groom’s. It can be quite an experience to attend these kinds of weddings. Getting there is half the fun, though on popular wedding days, the traffic departing Hanoi in the mornings and arriving back in the afternoons can be worse than city traffic jams. Often the travel time is far longer than the time spent at the actual wedding. In my experience, finding the location of the wedding is always quite a challenge. Because maps of rural areas in Vietnam are non-existent, finding the way once the town is reached involves asking directions from half a dozen or more locals – some who may not have a very good sense of direction. I’ve been known to actually phone the bride or groom for some decisive guidance. In several cases, special guides may be sent on motorbike or bicycle to greet guests at a particular landmark. In western weddings I know that it’s common for the ceremony to be delayed because the bride is late. In Vietnam, it is more likely to be the guests! In the countryside, weddings normally occur in the family home. Sometimes a tent is erected to accommodate the invitees, which commonly include the whole neighbourhood or village population. In almost all cases, relatives and neighbours are recruited to help arrange the event. They cook the wedding meal, erect the tent and decorations and are generally available throughout the day to deliver food, pour drinks, collect and wash dirty dishes. It’s a real group effort and the atmosphere is very warm as a result. The parents of the bride or groom are usually at the gate to welcome all of the guests before tea and candy are served prior to the wedding meal. There is little ceremony in these weddings, apart from the official welcome and a speech or two, mostly just to thank everyone for attending. Guests toast the couple by wishing that they love each other until they are old, in fact until their teeth and hair are falling out! There is no priest or celebrant on hand, no kissing of the bride or bridal waltz. But there is normally very loud music playing throughout the occasion and sometimes karaoke. Noise is atmosphere at these weddings. When it seems that all of the guests have arrived, people are seated for the wedding meal. Because there is a tradition to consult a fortune teller about the most auspicious time of the day for the groom to pick up his bride for the wedding, it is not uncommon for everyone to be sitting down to this meal at 9am. Numerous toasts of local rice wine or sometimes Vang DaLat are compulsory, regardless of the time of day. Chicken, beef, goat, pork, veal and dog are the most popular meats served at weddings in rural provinces but in some places they also add their local specialty. In Thai Binh, I ate cat once at my friend's wedding and I didn't know it was cat until I left the party. A range of vegetable dishes are also served and the meal is generally finished with more tea and seasonal fruit. And then it’s over. With little fanfare, the guests start filing out little more than ninety minutes after arriving, onto buses and into cars for the journey back to town.